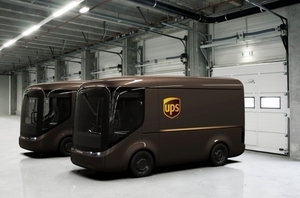 LONDON, May 09 /CSRwire/ - UPS (NYSE:UPS) today announced that it is working with UK-based technology firm ARRIVAL to develop a state-of-the-art pilot fleet of 35 electric delivery vehicles (EVs) to be trialed in London and Paris. These zero tailpipe emission, lightweight composite vehicles have a battery range of more than 150 miles (240 kilometers), which is significantly higher than other EVs currently in service. The vehicles will also come equipped with Advanced Driver Assistance Systems (ADAS) that help to improve safety and reduce driver fatigue. These features, combined with a highly advanced vehicle display provide the driver with an intelligent and connected vehicle.